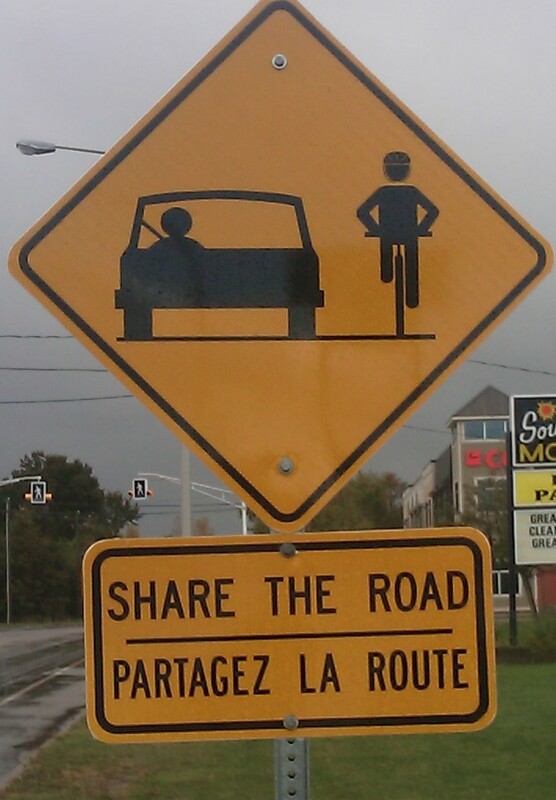 theBIKE.ca: Motorists... Please pay attention! WE HAVE JUST AS MUCH RIGHT TO THE ROAD AS A CAR DOES! I make a choice to commute by bicycle, if you don't, that's ok! I won't stop you from driving, and I don't want to. So why is it so hard for so many drivers to accept that a cyclist might not be an obstacle or a nuisance, instead of the part of traffic that we should be? Riding on a stretch of road that has 2 lanes going in my direction, the right lane tapers out and merges into the left around 100 meters ahead. There is no paved shoulder or bike lane, and the right edge of the road is curbed so I'm essentially in the lane with no place to go. The truck comes up behind me, and next thing I know I have 2 options... crash into a curb, or crash into a rapidly moving truck... I chose the curb, and down I went. After getting up and making sure everthing still worked, I got back on and continued my ride home, catching up to the truck a few blocks later. I tried to catch a plate but could never get close enough. I did catch the company name on the side of the truck. When I get home I looked up the company, and sent off an email expressing my displeasure with the caliber of their drivers. He chose to continue with his truck inches away from flattening a cyclist. On to the subject of bike lanes... the city of Charlottetown currently has 1 bike lane within the entire city....it is a few km of the road through Victoria Park on the waterfront. Great for a leisure ride, but pretty useless as a route to commute. However common sense has broken out at city hall and several construction projects in the city will be incorporating bike lanes, and several more will be added to other streets. Unfortunately there simply isn't the room to add these to many of the important routes through the city, so motorists and cyclists will need to learn to get along. Sadly, this is not my first and probably won't be my last incident with a car. I just hope that next time I'm still around to complain about it afterwards. Motorists, I leave you with one question. Is the time spent slowing down to safely pass a cyclist more valuable to you than my life is to me? ahhhhh I didn't realize this was an issue in little PEI too. It drives me crazyyyyyy! "2 wheels better than 4!"